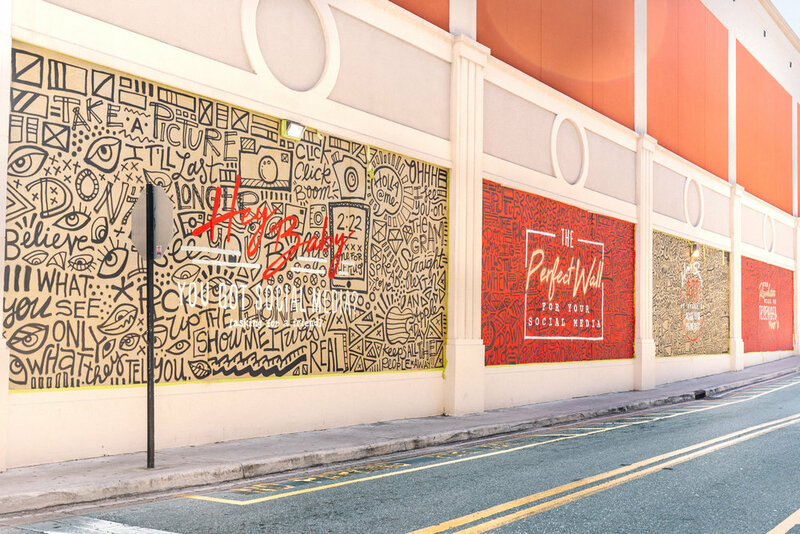 Employing Roy Lichtenstein as inspiration, West Palm Beach artist Charles Bane III has filled the CityPlace square with an explosion of word bubbles to celebrate Art Affair 2019. Visitors are encouraged to express themselves through the large temporary mural by filling in the words bubbles with their favorite quote, drawing their favorite super hero, or simply creating to their heart’s content. 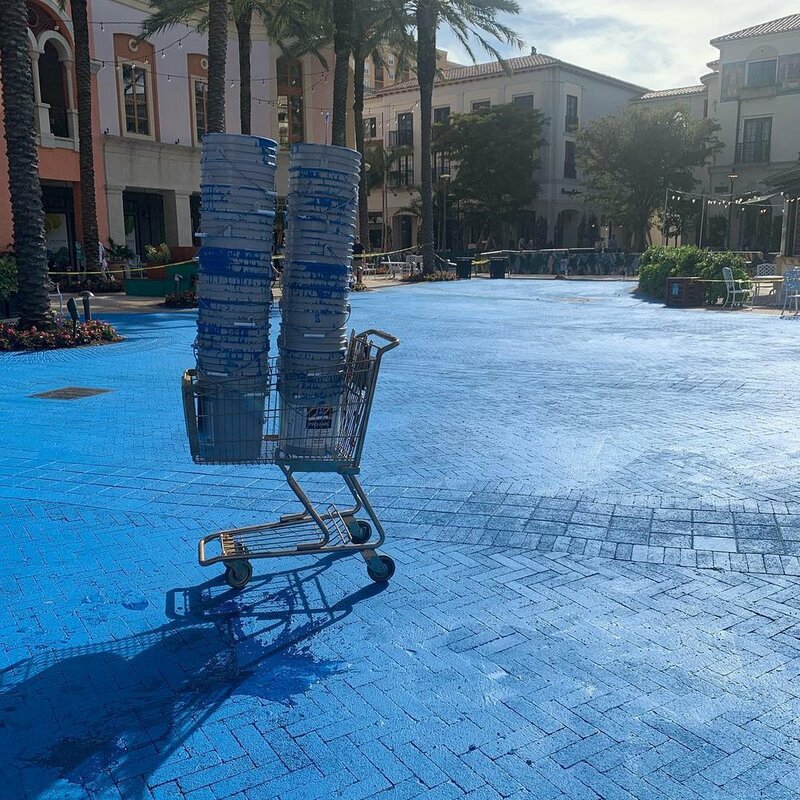 The installation is meant to signify the creative explosion that is preceding a new and reimagined Downtown West Palm Beach. The interactive mural will be up from April 1 to April 8. 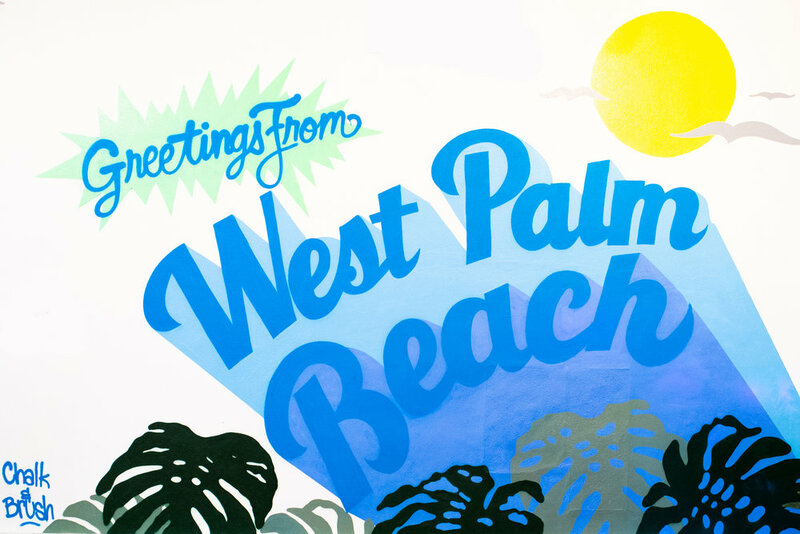 West Palm Waves represents the energy of our thriving city. In constant undulation, we are perpetually moving and expanding. Our connection to the water recharges us and propels us forward. Water is life, and the city is full of it. 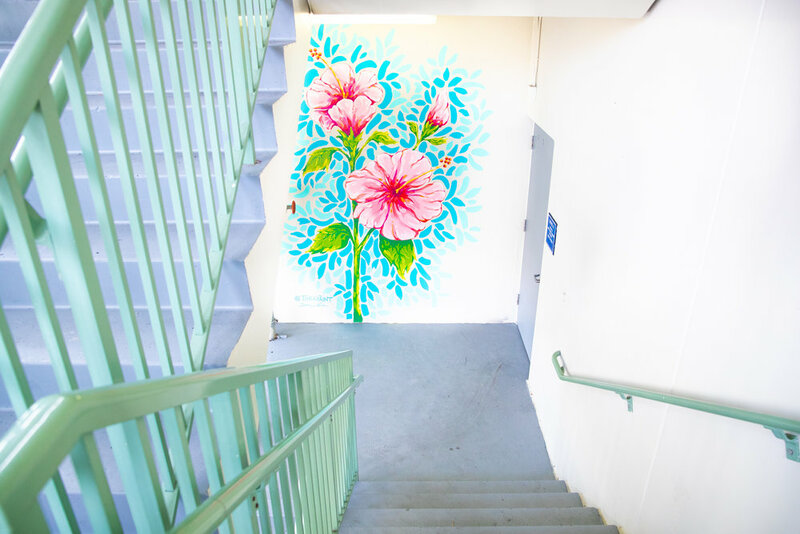 Located on the fourth floor of the garage, the mural reminds us of the power and beauty of our vibrant community. City Sunset captures the beauty of the western city view. Many of the condos and office buildings downtown enjoy spectacular sunsets. As the day winds down each evening, warm colors dance across the darkening blue sky. Positioned atop the garage, the mural personifies the natural beauty of the city we live in. This is a 3 part mural series, with a blooming flower that corresponds with each of the garages: Hibiscus, Gardenia, and Sapodilla, created with good vibes and lots of vibrant uplifting colors to make any passer by feel a little brighter. Home Away from Home depicts an imagined landscape that can either be viewed as mountains or waves. After 4 visits to West Palm Beach in a span of a year, 3 murals, 1 daruma workshop and meeting a whole new community of friends that are now like family to me, Florida has become a part of my identity and a place I consider my second home. When I learned that Wakayama Prefecture was the sister jurisdiction to the state of Florida, I wanted to include an image of Wakayama castle floating amongst cherry blossom clouds as a way to bridge the cultural connection between Florida and my home country of Japan. Cayla Birk.’s artwork re-conceptualizes social and cultural subject matters. In her work, she alludes to popular iconography, musical lyricism, and current verbal slang that pervade society. While boasting engaging, diverse subjects: secret orders, hip-hop music, and contemporary design - Birk.’s work reproduces familiar visual signs, arranging them into new conceptually layered pieces. A calm relaxing mural meant to capture that one moment of zen we all can enjoy in paradise. Captured by Natasha Rawding while on vacation. But a feeling we all can relate. Hybrid Infinity was painted on the east facade of the 581-ft garage and wraps around the south end entrance of the garage. The hand painted piece took three weeks to complete the east facade in December 2017, and the north facade was completed in November 2018 by Japanese-American painter Frankie Cihi. Monument represents restoring the planet’s hardware, addressing the idea of reusable energy and materials to better the environment.